Amber Rose’s ex-boyfriend and rapper, 21 Savage has an advice for rappers as he revealed what inspired his decision to stop wearing jewelry. 21 Savage who sat for the interview with Vogue Magazine in preparation for Saint Laurent Spring/Summer 2019 Menswear show in NYC he is somehow taking part in, said that he has never met a rich person that was decked out head to toe. “One is because everybody wears jewelry. I outgrew it; I’m getting a little wiser and growing. Another reason is because the richest people that I’ve ever met in my life, they’ve never had on jewelry. Every time I meet someone who’s very, very rich, like wealthy, I’ve never seen them with jewelry on”. “And ever since I’ve been saving money and not spending it on jewelry, I’ve been getting way richer. Maybe other rappers should take note” he said. In March, the rapper’s manager, Stone Mound Meezy, announced the “Rockstar” chart-topper “no longer wears jewellery.” Instead, Meezy said, 21 wants to make things like buying houses and investing in businesses “cool” for young artists to do. 21 Savage, born Shayaa Bin Abraham-Joseph, is an American rapper, originally born in Dominica. He achieved fame after releasing mix-tapes and EP’s in 2015 and 2016, which then led to mainstream success. 21 Savage began producing music towards the end of 2014. He began by releasing various mix-tapes. These helped get him noticed and in 2016, his EP Savage Mode reached the Billboard Top 200. In the same year, he released his debut studio album ‘Issa Album’, which also made the billboard charts, and set him up for future success. You’re probably most aware of 21 Savage from his collaboration with Post Malone on the song ‘Rockstar’. As of 2018, 21 Savage’s net worth is estimated to be $4 million. Not bad for only 3 years in the rap game! 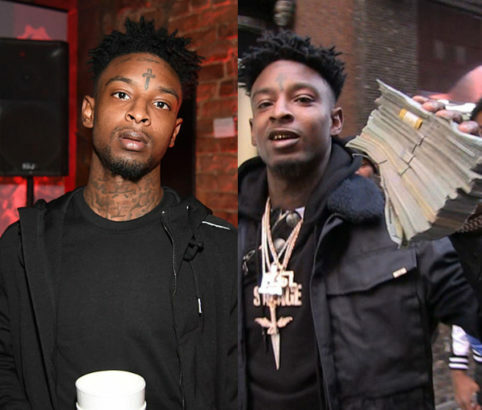 0 Response to "‘I became richer since I stopped wearing jewelry’ – 21 Savage"